This tutorial explains how to install Google Earth Pro on Ubuntu 18.04 Desktop. Google Earth is a software program that provides you with the ability to view the planet and save high resolution, three dimensional images of any location on the planet. 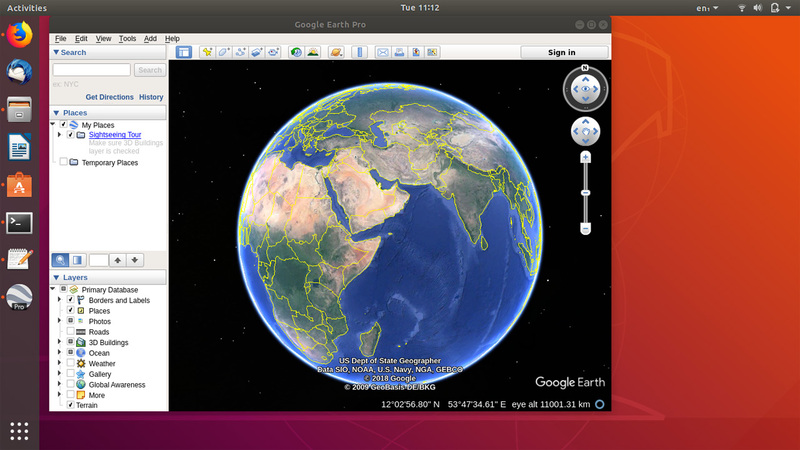 First download the google earth for Ubuntu 18.04. Go to the website google.com/earth/desktop and click on the download button. When you get the download page, download the 64 bit deb package for Ubuntu. Now that you have downloaded the deb package of Google Earth Pro, right click on the deb file and select "Open With Software Install". Once you get the software installer, click on the install button. After the installation process is completed, Go to the application menu and you will see the launcher for the Ubuntu Google Earth Pro. Now you can Explore the World with Google Earth on your Ubuntu 18.04 Desktop. Google earth provides you a three dimensional view of the planet using the satellite images and aerial photography. Save maps to paper reports and large High Resolution images. Measure distances, area, radius, and length using measurement tools. Create Videos and presentations with the Movie Maker feature. Fly around the world with flight simulator. The earth pro also includes other views such as sky, mars, google moon and the google earth flight simulator.